Card games don’t seem like the natural place to push a storyline but Valve are finding using every opportunity Artifact affords them to develop Dota’s world. This includes having heroes talk with each other when they share a lane. Want to get to grips with Valve’s new card game, here’s how to play Artifact. Gabe Newell told us at the Artifact reveal event that the card game wouldn’t have a single player mode beyond an AI to train against. That doesn’t mean Artifact won’t tell a story, though. “We said no campaign, not no story,” Valve developer Jeep Barnett tells us in an interview. 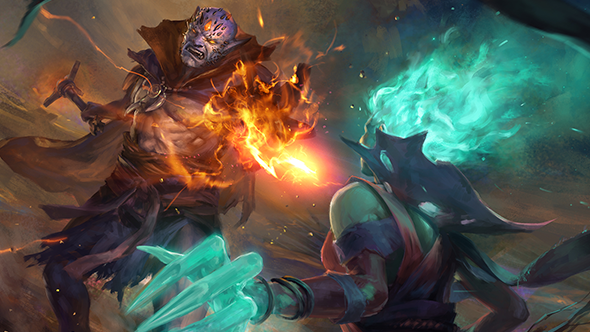 “We treat our cards as characters that exist within [Dota’s] world. Just like in Dota, they banter with each other – if you put two rivals in a lane together they’re going to yell at each other and comment on the spells that you’re playing. Story will also come through in the lore viewer. There each hero will deliver “a monologue where they can talk about different things that are going on within the world,” Barnett says. You can also pick things up from inspecting the cards. It’s going to be a subtle touch but, as Blizzard have done with Hearthstone’s talking legendary weapons, Valve will develop Dota’s universe with every tool in their arsenal.